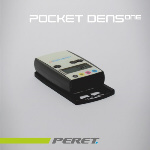 The POCKETDENS one is the standard CMYK densitometer everybody should have. It measures density, dot gain, and balance. 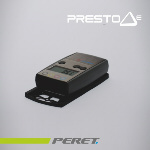 The PRESTOdE is the densitometer that can also measure delta E 2000. This is the ideal device for printers who sometimes have to control spot colors. The PRESTODX Basic is the densitometer that offers all densitometric measurement functions needed in the press room. It measures density, dot gain, SCTV, balance, and trapping. It can store density and dot gain references. The PRESTODX is the spectrodensitometer that offers all measurement functions needed in the press room. It measures density, dot gain, SCTV, balance, trapping, Lab and LCh. It can store density and dot gain references and up to 4 job reference books with 8 colors each.